Pedestrian crossings perform a semi-responsive automated sequence day in, day out. When the traffic light is green, the red man stands guard to hold pedestrians at the kerbside. 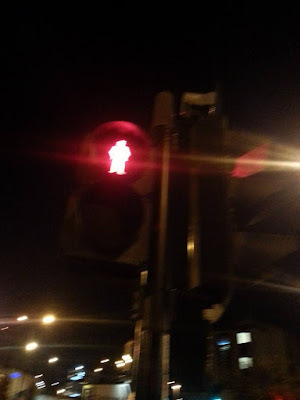 When the traffic light turns red, the red man goes off shift while the green man steps out, encouraging walkers to cross to the other side of the road. Something has gone wrong with one of the pedestrian crossings I use every day. The green man has gone missing. Had the bulb gone, there would be no green man, but there would be no red man when the green man should be on duty: then, both lights would be off. But this is not what has happened here. The red man stands on permanent guard, as if he were instead a red alpha monkey who has chased off the green pretender to his throne. And so the pedestrian is faced with a disruption to the familiar: the red traffic light and red pedestrian light shining simultaneously. Navigating this pass several times each day, I find myself calling across the road to confused pedestrians opposite that it is safe to cross. I live with a life-long condition with the pretty name dyspraxia. Essentially this means that I am not ‘neurologically typical’, or that, for whatever reason, the neurological connections within my brain have not joined up along the tried-and-tested routes of the majority of brains. Things are messier inside my head. Information regularly travels along a pathway, only to get stuck; either needing to take a longer route round, or getting lost entirely. For example, recently I was leading Morning Prayer, which concludes with the doxology ‘May the grace of our Lord Jesus Christ, and the love of God, and the fellowship of the Holy Spirit, be with us all, evermore. Amen.’ These are words I say with others every day. But on that particular morning, I couldn’t bring them out. I could access neither the words nor their sequence, and after three failed attempts I gave up. I regularly ask my wife ‘Do you happen to know…’ – to which she replies, ‘…when you might finish your sentence? No. Sorry.’ – or go to pass on information to one colleague, only to lose the name of the other colleague I want to refer to. Recently I had to change lines at an underground station and rushed from one platform, up an escalator and down another, to make my connection on time...only to discover that the train I needed to catch was delayed. An incident further along the line had required police assistance, and there was no way of knowing how long it would be before trains could start running again. All that could be done was to regular repeat an apology for the delay on the overhead arrivals screen and over the tannoy. As more trains passed through on the other line, and more and more passengers arrived on the platform we were delayed on, everyone began to feel increasingly claustrophobic. Commuters had kept a safe distance from the edge of the platform, but as new travellers swelled our numbers, they pushed through to stand in front of those who had been waiting. The unspoken tension built up, as we each calculated how three trains’ worth of passengers would get on to the first available train: whose ongoing journey was pressing enough to jump the queue; who was willing and able to give up their place and wait for the next train? In all we were held up for the best part of forty minutes. Waiting takes us to the edge of ourselves. That is, we are so used to displacing our limitations through the use of technology that we live much of our day-to-day lives displaced from ourselves. Waiting does not take us to the end of our resources so much as tentatively reintroduce us to our very humanity. We are not a technology. We are not a machine. We are embodied souls. The question is, will we embrace the gift? 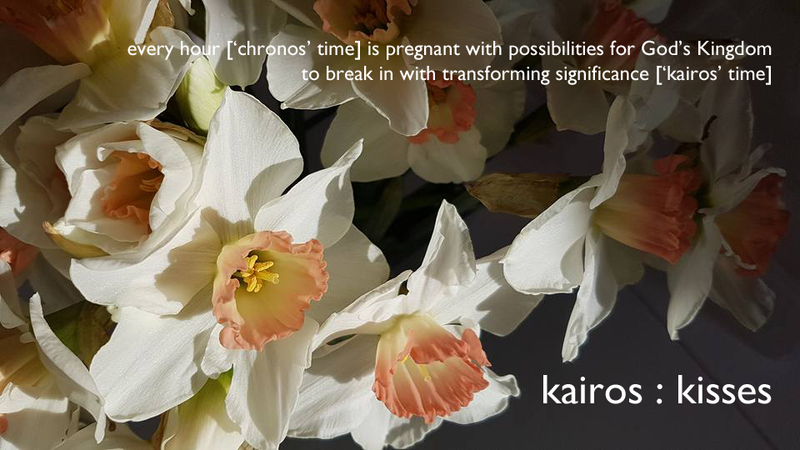 Will we allow ourselves to be embraced, and transformed through waiting - not made stronger, but more fully alive?